I think I will succeed, the main thing is to know how to do it correctly, at the current moment the token is created, but you need to learn the console, there’s a lot to learn and do - it’s not too late to learn, the main thing is to manul because at the moment the finger in the sky. Ok, so i should put my private seed (personal seed by waveswallet)?? Thank you very much, I’m starting with TESTNET. Once included and verified in the TESTNET the random seed key, according to the explanatory video (https://www.youtube.com/watch?v=WzhTk_rpngI) and following step by step we find the “adress”, there we must place the address of our wallet? and then the “public key” and "private are the ones in your wallet Amigo @siem I would like to know what is the purpose of delivering the public key and the private key In this case, we need to make an intelligent contract for an ICO, It is difficult to understand the programming of the video, it is not difficult to follow the tutorial step by step, it is difficult to understand what each function is for, otherwise we would be creating a contract that is neither intelligible to us and in the future not We could have good faith for us and less for those who know the project, please ask for help to achieve success. The video is outdated. 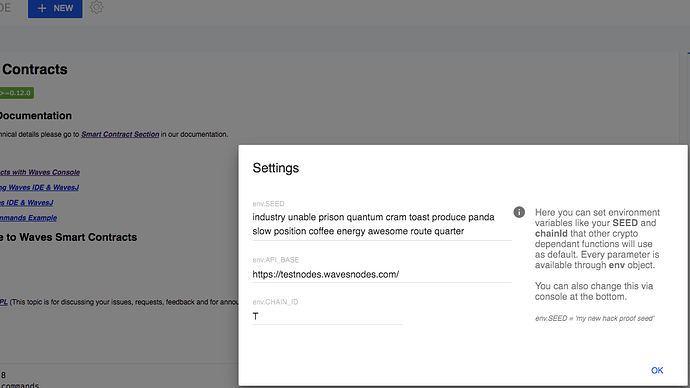 We plan to update it soon, but for now it is better for you to use console docs at github. Sorry, I’m not sure I understand your question. The only thing that identifies account is seed phrase. Key pair and address are derived from it. If you have some specific question feel free to ask, but the more specific you are the higher my chance to help you. I will be as specific as possible: We want to make an intelligent contract for a ICO project. 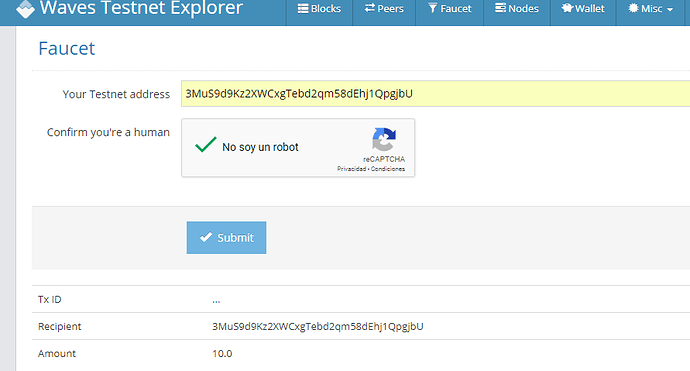 I am using the testnet before any real test. I accepted the captcha and done. then I put “keypair” in the console, I pressed “enter” and I got two keys: a public and a private one that in this case would be the private and public key of the address obtained randomly. My specific question is: what functions should I place so that my intelligent contract destined to an ICO can be carried out successfully? In other words, could you implement a special “type of contract” for ICO developers? 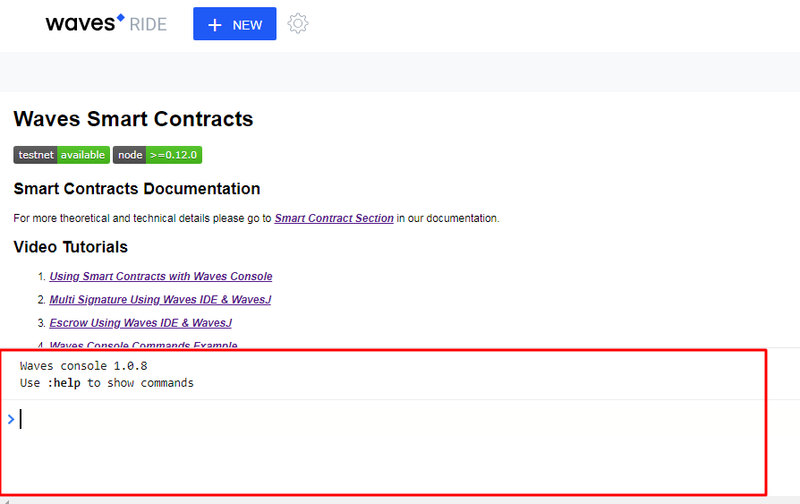 Is there a function that can connect a personal mobile application directly with the intelligent contract? I will be attentive and I will continue studying the console, since it has been difficult but not impossible to understand it. Regards from Chile! Seré lo más específico posible: queremos hacer un contrato inteligente para un proyecto de ICO. Estoy usando el testnet antes de cualquier prueba real. Acepté el captcha y listo. luego puse “par de llaves” en la consola, presioné “enter” y obtuve dos claves: una pública y otra privada que en este caso sería la clave privada y pública de la dirección obtenida al azar. Mi pregunta específica es: ¿qué funciones debo asignar para que mi contrato inteligente destinado a un ICO se pueda llevar a cabo con éxito? En otras palabras, ¿podría implementar un “tipo de contrato” especial para los desarrolladores de ICO? ¿Hay alguna función que pueda conectar una aplicación móvil personal directamente con el contrato inteligente? Estaré atento y continuaré estudiando la consola, ya que ha sido difícil pero no imposible de entender. Saludos desde Chile! 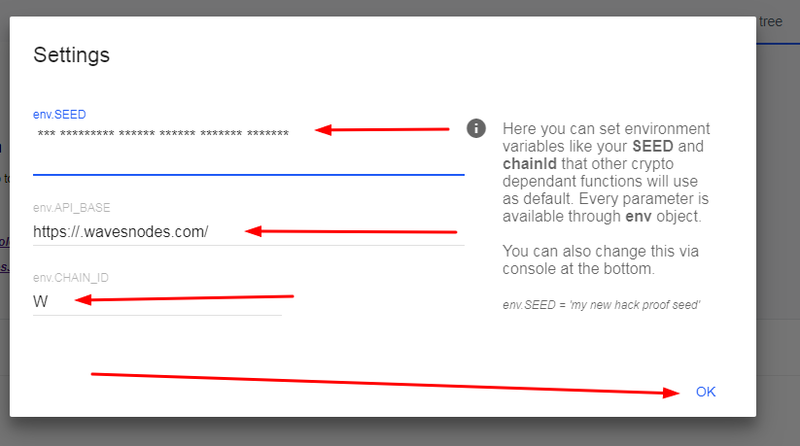 First of all: do not change env.SEED variable. Use settings instead. In future releases it will be impossible to use change “env” variable directly. You don’t need smart contract to create a token. You can create it via wallet or with issue transaction by hand. As I said. Console functions have nothing to do with smart contracts. You need to write your own application to do it. thank you very much @siem. I always believed it was for the creation of an intelligent contract. Today we have our token, its quantity and its decimals. This was created in the same wave wallet. The console would serve to obtain an immutable wallet. That’s the idea. The idea is that nobody can withdraw funds while collecting money in an ICO. Once finished, in case there are some ‘token’, burn them. Can all this be achieved through the console? in the waves wallet, once the token is created, my token points to “false”, how to change it to “true”? How to validate my assets with you? What do I need in this case? The setScript tx broadcasting doesn’t work. What problem? There is a problem with contract itself. We will fix error reporting soon, but for now, it is better to invoke async functions without ‘await’. That way you can expand returned promise to see actual error. But what does mean “ScriptParseError(VarNames: duplicate variable names are temporarily denied: ‘tx’)”? Can you please pm me source code of the contract? IDE now have accounts tab. You can add many accounts, new accounts have random bip39 seed. Select active one, which will be used in REPL by default. You can label accounts. Accounts are saved to localStorage. On first visit IDE now creates random account. Transfer transaction generator available via https://ide.wavesplatform.com/txGenerator route. GUI for signing arbitrary transactions available via https://ide.wavesplatform.com/signer route. Tx can also be published. Now has terminal-like autocompletion via ‘tab’ key.